A member of the buttercup family, southern blue monkshood is among the more than 250 poisonous species of the Aconitum genus. It’s also sometimes called blue rocket, wolf’s bane, or devil’s helmet. 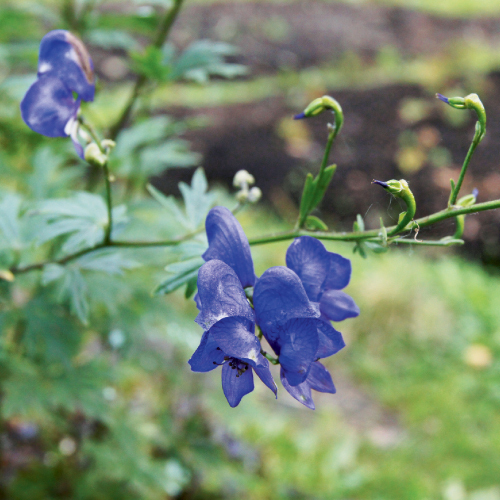 Reaching two to four feet in height, blue monkshood can be found in moist wooded thickets and on damp slopes. This perennial wildflower blooms in late summer and early fall. One-inch purplish-blue flowers, shaped like a hood, conceal two claw-like petals. It grows wild in at least 15 eastern states, and is considered threatened or endangered in five. Of the 19 North Carolina counties where you might spot this poisonous beauty, 13 are in WNC. A drug made from this plant has been used to treat neuralgia and sciatica. While not as toxic as other monkshood species, handling this plant is still dangerous, as the toxins in the roots can affect the body after being absorbed through the skin. The poison from the plant has played a role in many movies, books, and TV shows, including Harry Potter, Dracula, Teen Wolf, and Dexter.